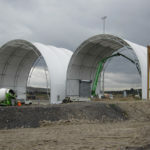 Global Fabric Structures offers design, manufacture and installation of pre engineered weatherproof fabric structures for temporary or permanent applications. 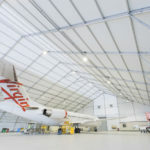 With a modular design and clear span coverage from 16m up to 100m, the GFS range of tensile fabric structures are a popular choice for large aircraft hangars and maintenance facilities. Our structures are ideal for soil and environmental remediation enclosures, excavation covers, chemical clean-up and recycling. We can provide a negative pressurised environment, limiting the impact of harmful contaminants. Whether you require a permanent or temporary facility for warehousing, manufacturing or simply storage, our industrial profiles provide cost effective clear span working environments and storage facilities. Global Fabric Structure sport halls offer a new generation of structures providing ideal indoor facilities for all sporting environments from swimming pools and tennis courts, to netball and gymnastics. Permanent and interim weatherproof fabric structures for various mining applications including heavy equipment covers, super-haul truck workshops, accommodation camps, warehousing and stockpiling. 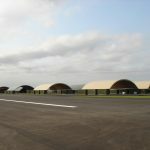 Global Fabric Structures contracts to the Military and Government sectors, providing a wide range of permanent and relocatable pre-engineered fabric structures. 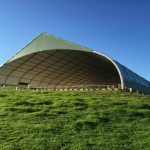 Global Fabric Structures specialises in the design, manufacture and installation of pre-engineered weatherproof fabric structures for interim or permanent applications. Our range of pre-engineered fabric structures are designed to be quick to install, easily relocatable and fully recyclable. We pride ourselves on our commitment to the delivery of unsurpassed project management and client service levels, not only meeting – but exceeding expectations, each and every time. Liners, doors, electrical, lighting, HVAC, OCE etc. Our state-of-the-art pre-engineered structures are designed for use across a myriad of applications, and can be customised to suit individual client specifications.